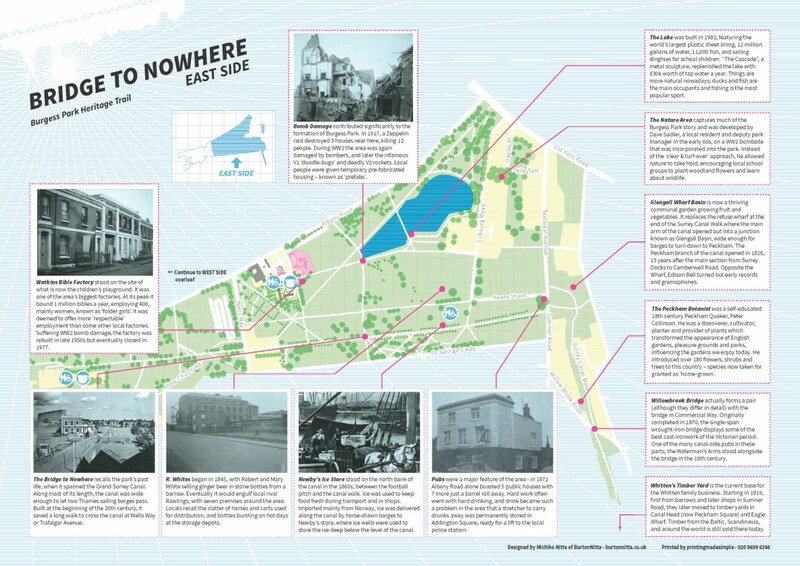 This is the story of Burgess Park – one of London’s biggest parks and the only area in South London to have been de-urbanised. Burgess Park’s significance is due not so much to its size but to its history, and the unusual way it was created within our living memory. The park slowly emerged from the space left by demolished factories, churches and streets as well as bomb damaged areas and the filled-in Grand Surrey Canal from Camberwell to Peckham. The park was inspired by local people like Jessie Burgess who the park is named after, by post-war optimism and by the Abercrombie Plan – a grand plan to rebuild London in the 1940s. The aim of the park was to create a ‘green lung’ for South London. The Friends of Burgess Park who want to protect, promote and enhance this important inner-city London park, hope that, with the benefit of Lottery Funding, the park’s heritage will be remembered. Uncover the park’s intriguing history with our Burgess Park Heritage Trail – from rich farmland and market gardens supplying London’s growing population during the 18th century to the 19th/20th century sprawl of industries with its busy streets, shops, pubs and people. 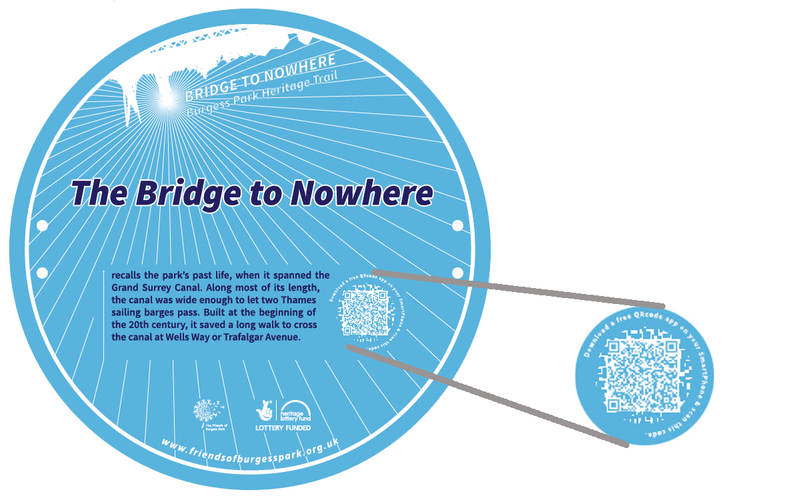 Each plaque tells a story and by scanning the QR code you can uncover the hidden stories of Burgess Park (you may need to install a free QR app on your mobile device). 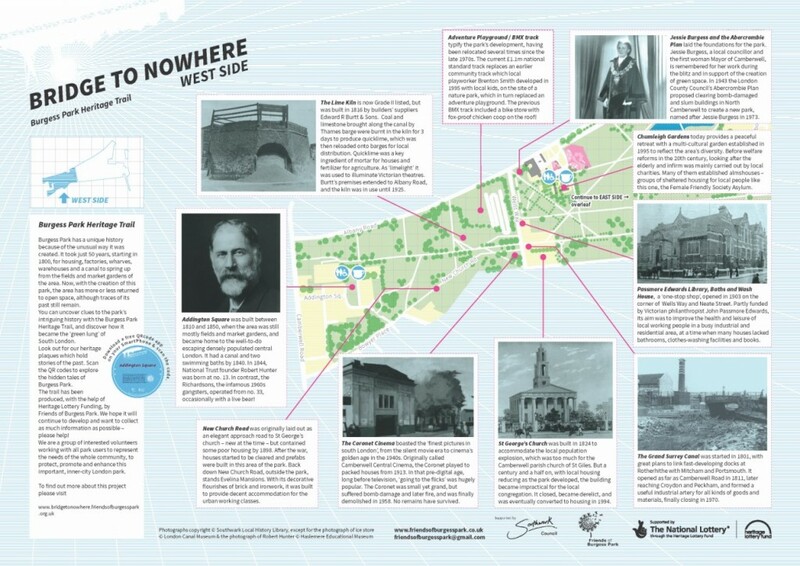 To enjoy this fascinating story you can download the heritage trail map. If you find any inaccuracies or if you would like to make a contribution to the historical record please contact us at friendsofburgesspark@gmail.com, or add your own comments at the bottom of each page.